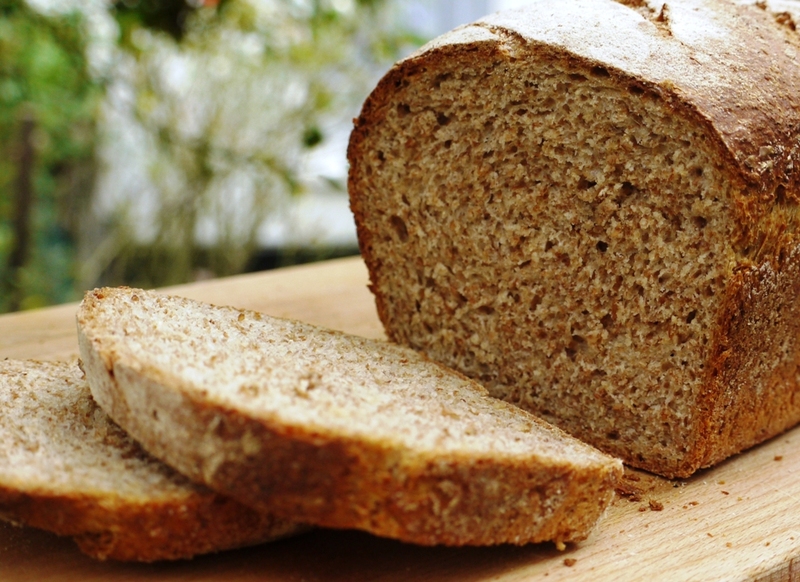 The first recipe I ever posted on this blog was a simple malted loaf. Back then it felt like such an achievement – a whole afternoon of weighing, mixing and kneading, praying that it would rise, that the oven was the right temperature and that I’d end up with something edible after all that effort. Nowadays, after nearly two years of baking my own bread, it feels like second nature, a simple Sunday afternoon task to set me up for the week. But however confident I’ve become, underneath it all there’s still a small sense of joy when I remove a beautifully baked loaf from the oven, an excitement that this is something I can create in my own little kitchen and a wonder at the magical alchemy taking place. Going back over early blog posts is a little like looking at photos of yourself as a teenager. Some bring back fond memories, others make you wonder what on earth you were thinking and realize that what you felt was acceptable back then doesn’t really cut the mustard in terms of how you see yourself today. I’m not saying I’ve reached a place where I’m 100% happy with my photos or writing or recipes, but take a look at that very first blog post in comparison and I think you’ll see what I mean. 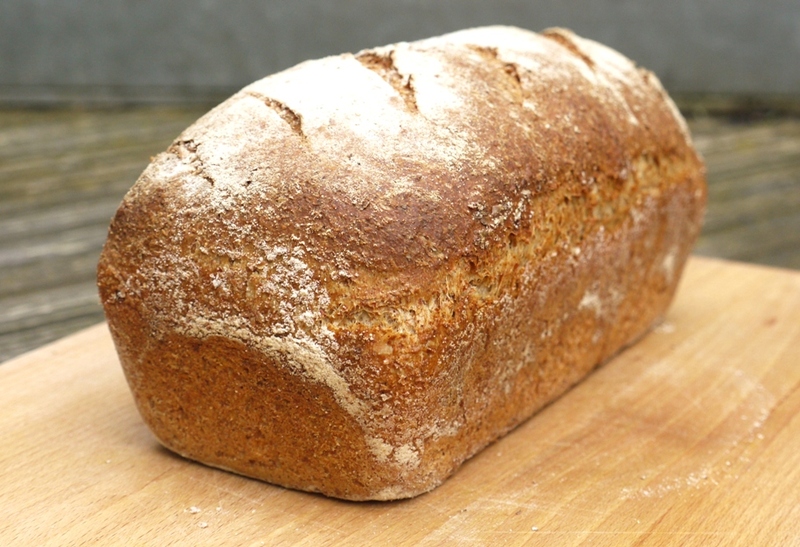 I’m posting this recipe today because, after a couple of years of experimenting, it’s the best simple, straightforward, everyday wholemeal loaf that I’ve found. A little malted wheat flour keeps it light, olive oil keeps it soft and fresh for several days and it takes just minutes to mix, knead, shape and bake. I’m not suggesting that it’s going to blow anyone away in terms of taste and texture but it’s a delicious everyday loaf and perfect for sandwiches or toasting. One of my favourite ways to eat this bread is toasted and rubbed with garlic, spread with mashed avocado and sprinkled with chilli, coriander and lime. Avocado with poppy, pumpkin or sunflower seeds is a lovely, crunchy alternative, or replace the avocado with silky scrambled eggs or herby homemade hummus and you’ve got the simplest and most delicious of suppers. It toasts beautifully and sliced thin, spread with butter and filled with cheese this bread also makes an amazing toastie, toothsome bread giving way to a molten middle with those lovely little crisp bits where the cheese spills over the edge and melts into a salty golden crust. This recipe makes one medium sized loaf, enough for a couple of lunchtime sandwiches and several slices at breakfast each for the two people in the little loaf household. If you have a bigger appetite, a family, or simply fancy halving your workload and making one for the freezer, double the quantities to make two loaves. Tip the flour into a large mixing bowl. Add the yeast to one side and the salt to the other (salt in direct contact with the yeast could kill it or slow it down). Add the olive oil and 200ml water and, using a plastic dough scraper or your fingers, work together the flour mixture and water. Slowly add the remaining water until you’ve picked up all the flour from the sides of the bowl and the dough is soft, but not soggy. You may not need absolutely all the water. Tip the dough onto a lightly oiled work surface and knead for 5 – 10 minutes until the dough forms a smooth, soft skin. At first it will feel wet and sticky – continue kneading and you’ll end up with the smooth texture you’re looking for. Shape the dough into a round and place in a lightly oiled bowl. Cover with a tea towel and leave to rise until the dough has doubled in size. This could be anything from one hour to three, depending on how warm your kitchen is but don’t worry too much about leaving it too long, the dough should be fine left for up to three hours. Rub a thin layer of olive oil into a 1kg loaf tin. Tip the risen dough onto a lightly floured work surface and knock the air out of it by folding inwards repeatedly. Then flatten the dough slightly and form into an oblong by folding the sides into the middle. Press firmly on the dough where it joins to create a good structure then place your dough in the prepared tin, making sure the join is underneath. Place the tin inside a black plastic bag and leave to prove for about one hour, or until the dough is doubled in size and springs back quickly if you prod it with your finger. Preheat the oven to 225 degrees C and fill a roasting tray with hot water, placing it on the bottom shelf. This will create steam to help your loaf rise with a lovely crust. Dust the risen dough with flour and slash the top with a sharp serrared knife or razor. Bake for 30 minutes or until the loaf is cooked through. Check by tipping the loaf out of the tin and tapping the base – it should sound hollow. Remove your loaf from the oven and cool out of the tin on a wire rack. Beautiful looking loaf. I very much liked you food writing in the paragraph about toast, garlic, avocado and other delicious ingredients. I’m surrounded by wonderful bakers and always have good cereal bread in the house, which soon will be toasted and enhanced with your excellent ideas. This loaf looks perfect. 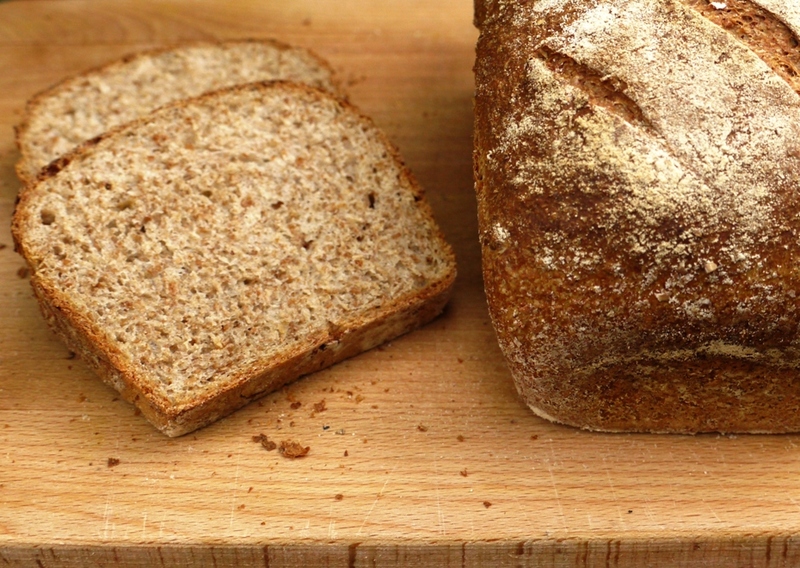 I’ve never used malted wheat flour before… I’m going to have to hunt it down! This loaf looks so professional! I need to start my 2 years baking practise asap! This really does look like a perfect loaf of bread. I still haven’t got quite as comfortable with bread making as I should be; your bread posts are always so inspiring! That loaf looks so good, I’m almost tempted to give my sourdough a rest this week and make your loaf for a nice change to our morning toast and lunchtime sandwiches. What a gorgeous loaf. It looks like it’s come from a professional bakery! I’ve been baking bread at home for almost a year now and it’s so rewarding and relaxing. I love baking bread too now. I have to say I found Richard Bertinet’s kneading method was a revelation for me in terms of the texture of my loaves. They were fine before but so light and perfect, though your kneading technique is clearly pretty much spot on! Food Photography & France – thank you and hope you enjoy the new found flavours! 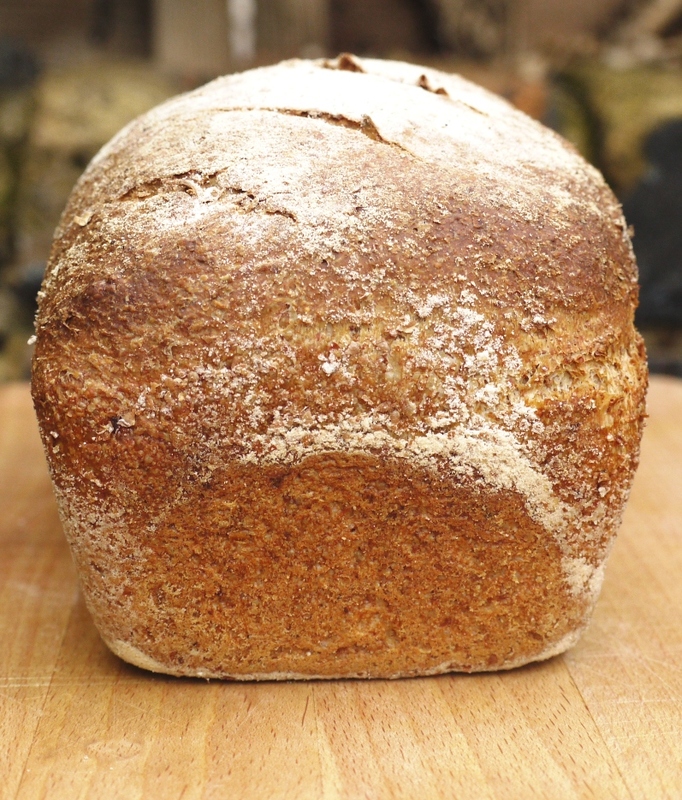 Connie – it’s lovely – adds a delicious malty flavour and lightens the loaf slightly as it’s a white flour. Jenny – ahh, thank you! Choclette – I found sourdough a bit much to eat every day for lunch – I love it but sometimes it’s just a little bit strong. This is the perfect fallback for when I’m not eating sourdough. Jennifer – you’re so sweet, thank you so much! Franglais Kitchen – Richard Bertinet is brilliant. I went on his baking course with my Mum last year and absolutely loved it. Having said that, I don’t always use his method – I think the more you bake the more you find a kneading technique of your own that just works! Hi little loaf. I know exactly what you mean about the excitement of taking a loaf out of the oven. It gets me every time! relief and happiness! It is interesting to hear that you are a fan of the Paul Hollywood book. I love Richard Bertinet’s book ‘Dough’ (and my husband bought me his new book on pastry a couple of months back when he was in Bath which is excellent too). I have a feeling you may have attended his breaking class so I guess you have the book too. How does it compare to the Paul Hollywood one? What a loaf! My husband is the bread baker in our family. I will pass the recipe along to him. This looks beautiful and delicious. That loaf looks professionally made and I mean that in a GOOD way. Lovely photos, too! The thing I’ve found about bread baking is that it really is so gratifying and satisfying every time. This is one beautiful loaf! Amy – both books are good in different ways. Richard Bertinet’s kneading technique is unusual but once you master it the dough always seems to come out beautifully. Paul’s recipes are slightly more British and – of the ones I’ve made so far anyway – pretty failsafe too. In other words, I love both books! Debs – aw, thank you. I hadn’t planned to blog this loaf then it looked so lovely sitting on the side I had to take a few photos! Becs – it’s a great work out and so therapeutic! any tips for my favourite teabreak ,fruited bread ? Bill Granger does a lovely muesli breakfast loaf (should come up if you google it). Otherwise I’m planning to make malt loaf soon so watch this space! This makes a fantastic loaf of bread (currently trying not to gorge myself on yesterday’s double quantitiy bake!!). Thanks for sharing the recipe :-). You should be able to find it fairly easily…if not, perhaps have a look online? Hi, Lots of comments on the photo’s which is what inspired me to try. I’ve never made bread before (except pizza dough) but thought I would give it a go. Searched for an easy bread recipe and your’s seemed to fit the bill. Even so it was a stretch project as at the same time as baking I was also looking after the kids (aged 2 years and 6 weeks respectively) and uninstalling 2 built in kitchen appliances (a fridge and a freezer). When I was kneading the dough it seemed a bit sticky, even though I had only used about 220ml of the water, so I ended up adding quite a bit of extra flour. Left it an hour, gave it another knead, realised my tin was much too big, put it in anyway in a thin layer, left it another hour (put the kids to bed) and put it in the oven (went and had a shower). When I got back 25 minutes later it looked done so I took it out. And it was perfect! Looked pretty much exactly like yours (but thinner) properly cooked all the way through, no burning, perfect crumb and tasted great! So hats off to you – if the recipe works in these circumstances it should work anyway! 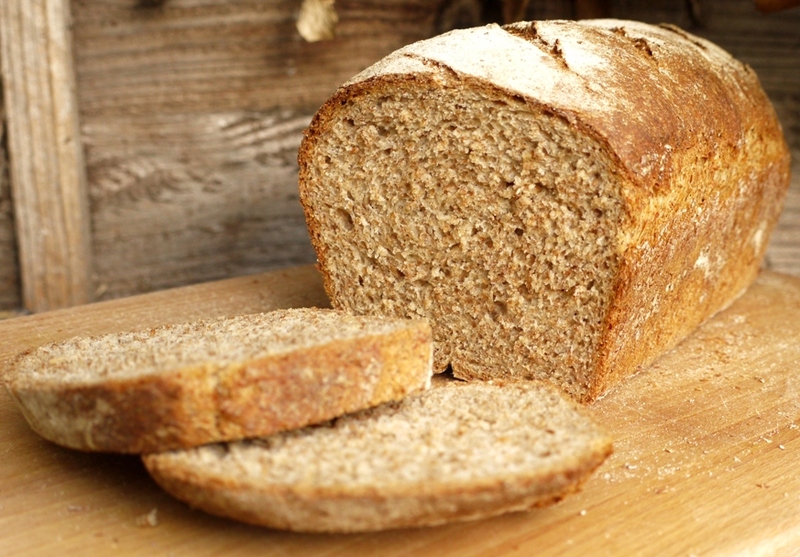 This is a great and tasty loaf, I’ve been making it every other day, and my family all love it. So thanks! Don’t worry if the dough’s a little sticky at first, it soon becomes nice and smooth with a little work. I find that in winter it can help to warm the flour first in the oven to speed up the first proving. The flavour also improves if you give it a good 3 hours or so in the second proving (in the tin).